My Mum and Dad were married in the small church in Dorset Gardens Brighton on 7th May 1928. My Mum, Winifred Reeves was 18 years old and my Dad, Stanley Smith was 20 years old. They were married nearly 50 years. 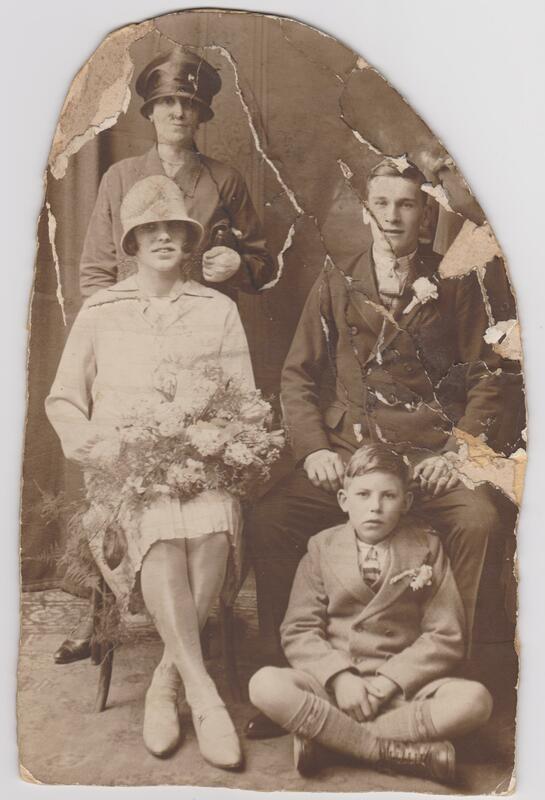 My Mum’s Mum, Edith Reeves stands behind her and my Mum’s brother Joseph Reeves sits on the floor. The bride’s outfit is a wonderful example of the style of the day with her cloche hat and knee length skirt. What a lovely photo. Your mum looks beautiful. They must have been very much in love. They look the perfect couple. The little chap looks so sweet.